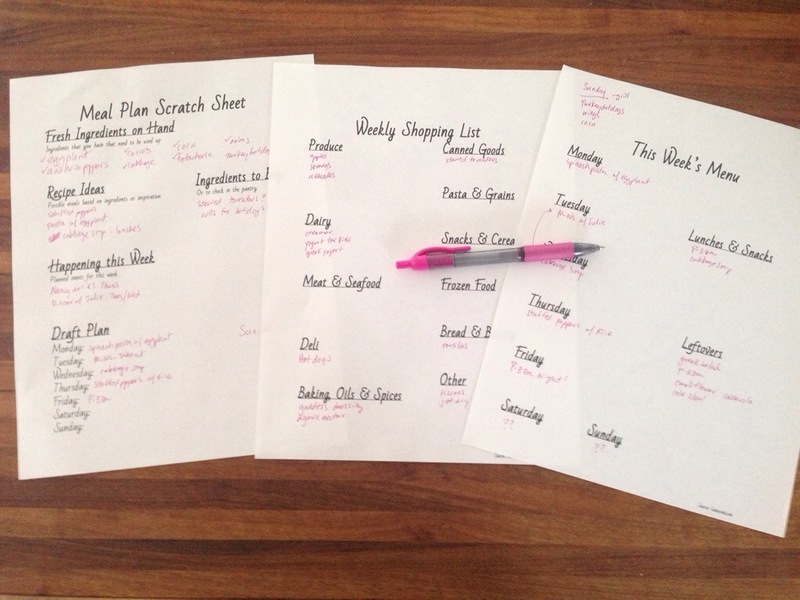 I’ve created a Meal Plan Scratch Sheet Printable to help you through this process. Throughout the week, keep an eye out for any recipes online, on TV, or in magazines that look fun to cook and eat. Check out the fresh ingredients you have in the fridge, organizing everything that needs to be used up quickly on one shelf. Think about recipes that you might like to make that include those ingredients. Review the calendar for the upcoming week for anything that might impact dinner one night. Maybe you have plans for an evening, need a quick on-the-go dinner, or will have limited cooking time one day. Start to draft a plan of your meals day by day. Don’t worry about scratching things out or moving them around, this is just a draft. As your plan starts to solidify, jot down ingredients that you know you’ll need to buy or items that you need to check to see if you already have in your pantry. Then create your final meal plan for the week (printable here) and create a single, organized shopping list (printable here). If you give this process a try, let me know how it goes!